At the center of Eastland's town square, locked away behind two layers of glass, a Texas legend lies in state. Once the subject of newspaper columns around the country, he now rests in near obscurity. His name is Old Rip, and although you may have never heard the name, you're almost certainly familiar with his story––the basics of it, anyway. A demolition worker pries open an old cornerstone, only to find a lonesome frog. Within moments, the frog bounds to life and begins to sing snappy jazz. Thrilled by his discovery, the man attempts to capitalize on the frog's amazing abilities, only to have the creature go lifeless at every crucial moment. It's one of Warner Brothers' most popular cartoons. What most people don't know, however, is that the story is based on an event that took place in Texas in the late 1920s. As Eastland was tearing down its decaying courthouse in preparation for a more modern replacement, scores of residents became excited to find out if a certain local tale was true. 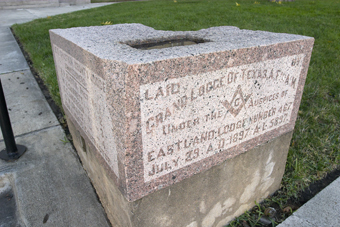 Ernest Wood, who was county clerk at the time the old courthouse was constructed, was said to have placed a live horned lizard inside the building's cornerstone. 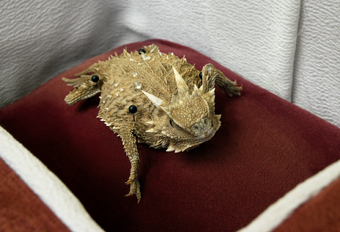 It had been a long-held belief that horned lizards could endure extended periods of isolation, bereft of food, water and air, and Wood had evidently decided to test the theory. That was 1897. Thirty-one years later, everyone was geared up to discover the truth, and even more so to discover if the lizard had survived. It was reported that as many as 2,000 curious Texans crowded together on that cold February day to witness the opening of the cornerstone. As they looked on in suspense, the block was cleared and its covering removed. Officials pulled from the cavity a small collection of items that had been entombed there––newspapers, a Bible, then something that was described as looking like a piece of tree bark. It was the horny toad! As County Judge Ed Pritchard held the desiccated reptile aloft, the crowd was amazed to see it twitch, then wriggle to life. Not only did the little guy exist, but he had survived! The miracle snoozer became an instant sensation. He was dubbed Rip van Winkle, a name quickly shortened to Old Rip, and travelers arrived from miles away to get a look at him. He went on tour, visiting Dallas, New York, St. Louis, and even Washington, D.C., for a meeting with President Calvin Coolidge. Though no heavier than a couple of ounces, the remarkable reptile carried a lot of weight. Sadly, after three decades encased in stone, Old Rip didn't have much life remaining. Less than a year after his emergence, he contracted pneumonia and died. He had been living on borrowed time. Unwilling to give up their main attraction, though, Eastland had the body preserved and placed in a diminutive casket. Both Rip and his former residence were put on display at the Eastland County Courthouse, where you'll find them today. Warner Brothers' version may continue to enjoy fame as mascot of the WB Network, but Eastland is where you'll find the real celebrity. Here in Eastland we still celebrate the memory of Old Rip. Chief among those who honor him is Bette Armstrong, who is also known as the Toad Lady. Bette is a relative newcomer to Eastland, having moved there with her husband in 1993. But she quickly became obsessed with the story of Old Rip. Out of her store, Bette’s Bits, she sells wooden and stuffed horny toads. But it doesn’t end there. Each year, Eastland holds a parade where Armstrong appears dressed head to toe in her own horny toad outfit. Nary a public function occurs where the toad is not honored and the Toad Lady does not make an appearance. Bette has come to be known around town as much as the old toad she honors. One look at her in her toad outfit, standing amongst a crowd of fellow lovers of Old Rip, speaks to the lengths Eastland residents go to honor their most famous local hero. –Doris T.